Inger Andersen. New Delhi, India. 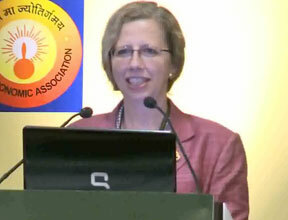 The importance of breaking down barriers that separate whole sectors and individual partners was a central message of the keynote address that Inger Andersen delivered to last week’s conference on agriculture for improved nutrition and health, held in New Delihi, India. Speaking from her vantage point as Chair of the CGIAR Fund Council and as Vice President for Sustainable Development at the World Bank, she stressed that both the CGIAR and World Bank are willing partners in moving forward. To convey what “the way forward” might look like, the conference organizers from the International Food Policy Institute (IFPRI) prepared an initial draft synthesis of its conclusions, to which IFPRI Director General Shenggen Fan made reference in his closing remarks. 1. Fill the knowledge gaps. While the linkages between agriculture, nutrition and health may seem obvious, many questions remain to be answered before effective policies can be designed to encourage better outcomes in all three spheres. Much can be done now, however, to lessen the damage agriculture causes to human nutrition and health, including more effective prevention of occupational hazards and control of diseases associated with agriculture. 3. Seek out and scale up innovative solutions. Other important steps are to identify and better understand interventions already tried in agriculture that have improved nutrition and health cost-effectively and to build on these gains by designing programs that create synergies between the three sectors. 4. Create an environment in which cooperation can thrive. To remove the “language barriers” and other divisions between these sectors requires a new way of thinking and working, reinforced by clear guidelines, incentives, leadership and advocacy. Fan underlined that the synthesis is a “living document, subject to further debate” and invited comments on the text at the event website.